Us gamers are a competitive lot, we are winners, so we find ways to get ahead of the pack. When playing, we know every single advantage counts, even the tiniest improvement in skill level is the difference between winning and losing. What we sometimes do not realize is it’s not only the honing our skills, or knowing the game that gives us an edge. Surprisingly our gaming environment plays a huge role in how successful we are at winning or losing. Two of the key parts of our gaming environment are what we seat on and the surface we rely on for the controller/ mouse – the mouse pad. Because of our extended use of these two items – the chair and the mouse pad, we can get enormous improvements when we get the best-suited products for gaming chairs, and the best-suited products to use as a gaming mouse pad. That is why we need to take advantage of the Black Friday sale in Canada on 123ink.ca. On this day you will be able to win on two very good deals. You heard that right, two deals. On the gaming chairs and gaming mouse pads. 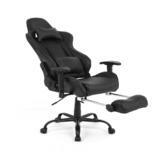 Another multi-purpose chair that serves both as a gaming chair and a computer desk, the Moustache® Ergonomic Racing Gaming Chair also includes a padded armrest (for resting tired arms during extended play) as well as a soft headrest. It also offers an adjustable padded lumbar support for your back, ensuring back pain during game time is a thing of the past. Coming in two colour variants, – black and blue and black and white. 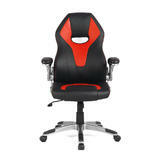 This high-end gaming chair is offered at $119.99 which includes free shipping within Canada. You will get a 13% discount (bringing the price to $189.99) for this high-value gaming chair, and it comes with free shipping within Canada on 123ink.ca. For this low price, you get a well-reviewed chair with headrest pillow which has been orthopedically and ergonomically designed to support your back. And it is well finished in premium PU leather. 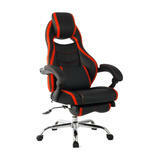 This is a top of the line executive chair is also capable of being used as a gaming chair. Apart from coming finished in premium PU leather, having a lumbar support and headrest pillow; the gaming chair comes with a Tilt Locking mechanism (90-180 degrees angle adjuster) that allows the chair to be adjusted to a full recline position if required. 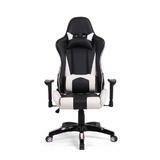 The chair is also ergonomically designed to relieve fatigue and support the back. It goes for $299.99 including free shipping within Canada. Compared to other similar makes that go for almost $400. The 123ink.ca Black Friday offer in Canada allows you to get the Moustache® Gaming Mouse Pad, Extended Large Size, Non-Slip Anti-Fray Cloth Surface at a large discount. This gaming mouse pad gives you a large surface mouse pad (dimensions 900mm by 400mm). That provides a mouse optimized surface big enough to also hold your keyboard, as well as providing ample room for your wide arm movements while gaming. The pad comes with a steady natural base with anti-slip properties as well as a smooth fabric type surface that works with all mouse types. Compared to similar products that sell at $25. The mouse price can be obtained at the special discount price of $9.99 which includes free shipping anywhere within Canada. How to Replace Chip for Brother TN760 Toner? 40% off Moustache® Waterproof Laptop and Tablet Bag, among many Black Friday deals at 123ink.ca!